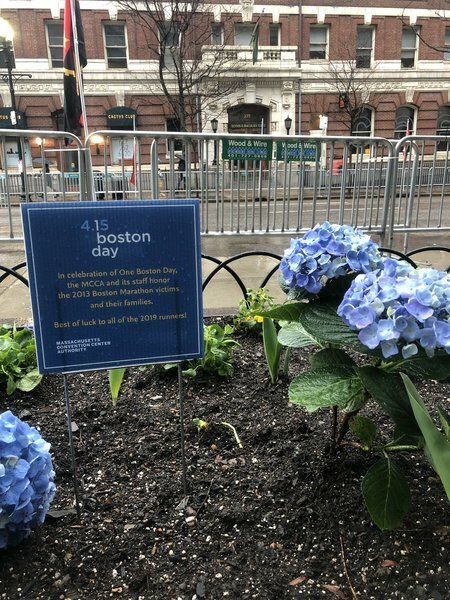 Just before 2:49 p.m., announcers at the Boston Marathon finish line will say a few words recognizing April 15, 2013, before pausing for a moment of reflection and remembrance at 2:49 p.m. The bells will ring at Old South Church following the moment of reflection. 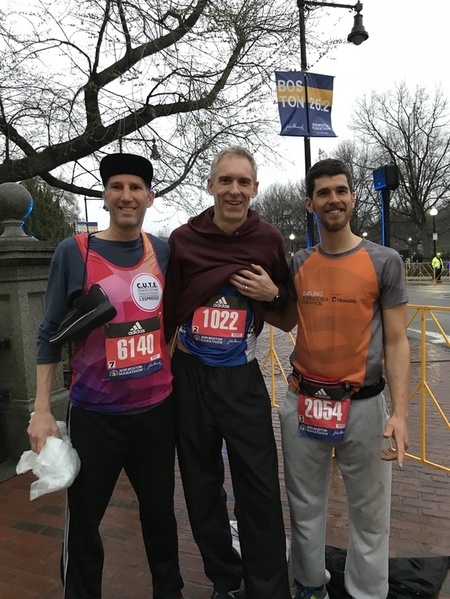 Mainstays in races around their native Montreal, Jim Rondeau, Michel Cusson, and Charles Beaulne traveled to Boston separately but caught up before loading the buses to Hopkinton. 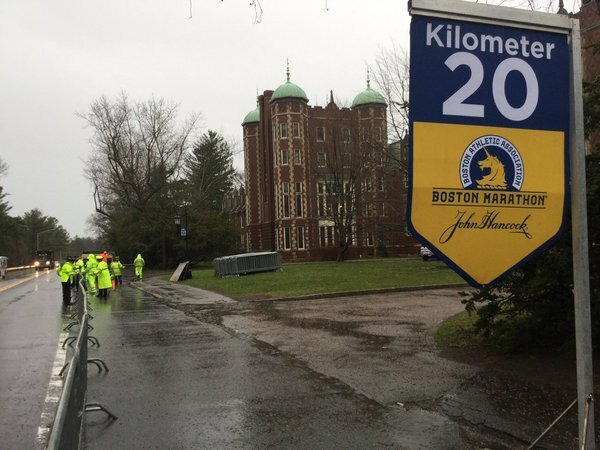 Cusson, 51, is running Boston for the 10th consecutive year, and checking another milestone off of the list in the process as it’s his 20th overall marathon. 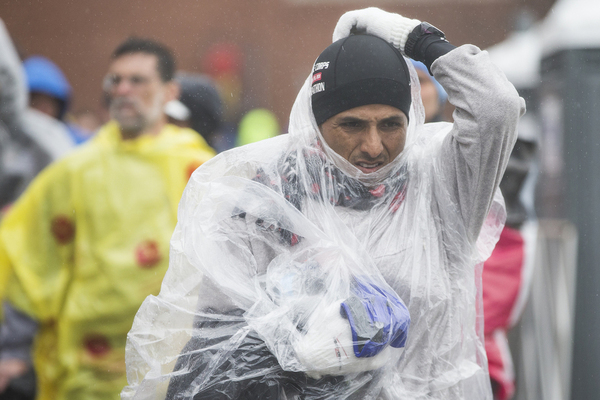 His personal best marathon time is 2 hours, 44 minutes, set in Montreal’s Courses Thematiques Marathon SSQ de Longueuil. 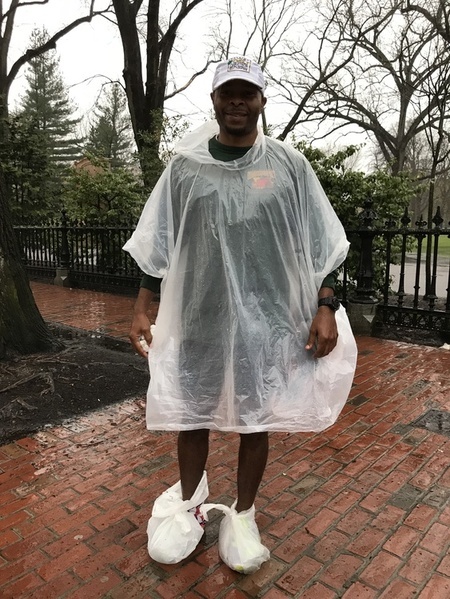 His top time in Boston is 2:52. 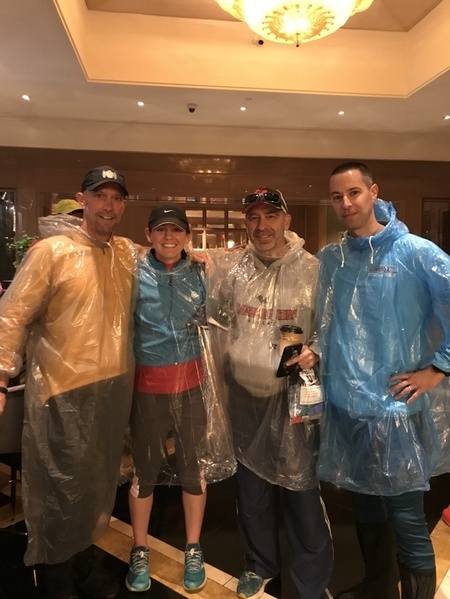 Rondeau, 44, and Beaulne, 29, primarily train for and run triathlons. 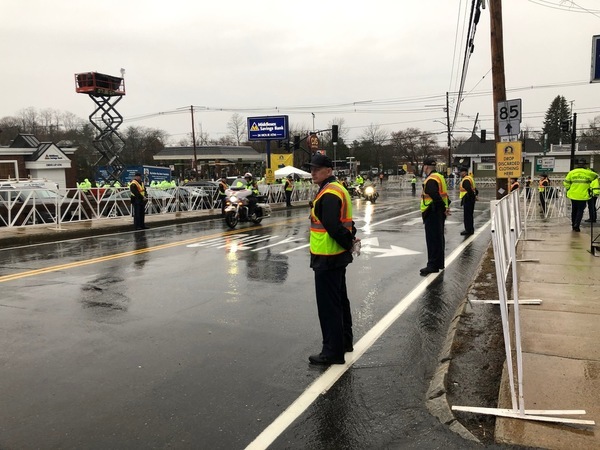 For Cusson, it’s the energy of the crowds that keeps him coming back — the same thing that motivated Rondeau and Beaulne to run their first Boston Marathon this year. 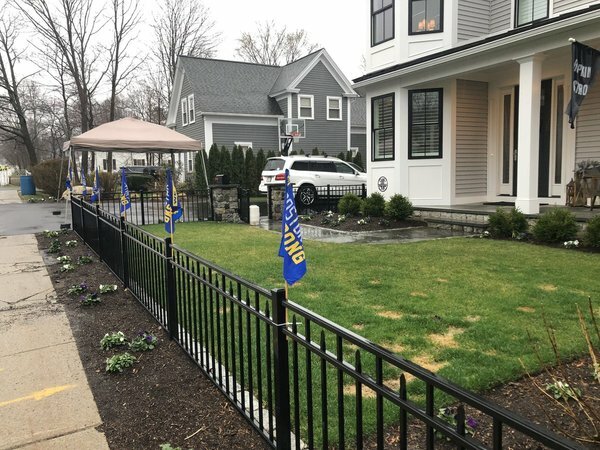 Happy Marathon Monday! 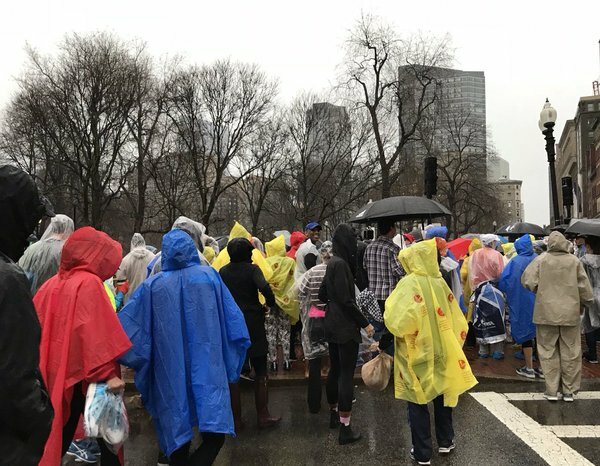 I’m at Boston Common, where the skies just absolutely opened up on what had so far been a gray but relatively dry morning. 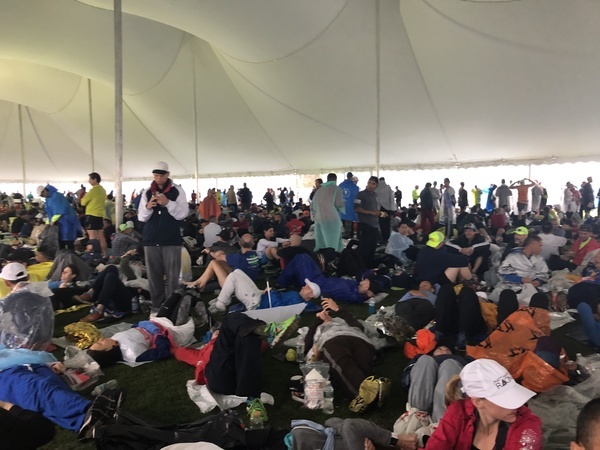 Spirits are still high with runners here, who are waiting to check their gear and board the buses to Hopkinton. 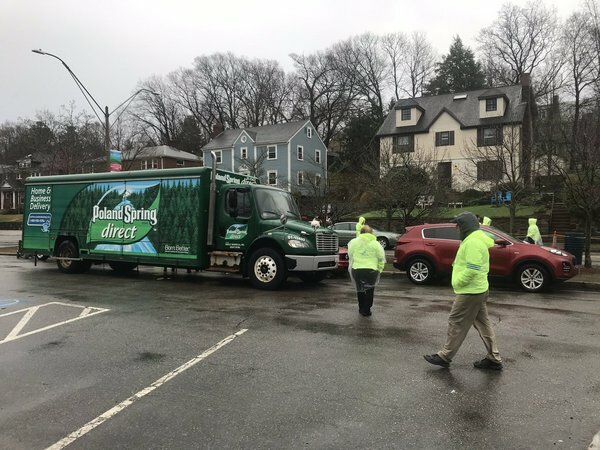 Watch out for large puddles as you're driving the next couple of hours. 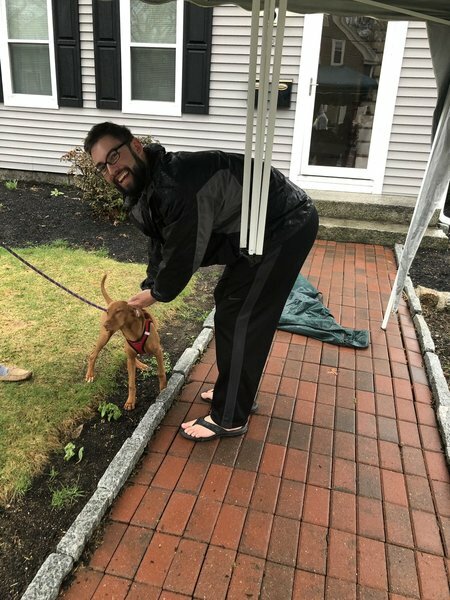 Brown said “the lightning threat is abating.” The closest lighting they’ve seen on the radar is in Providence, RI. 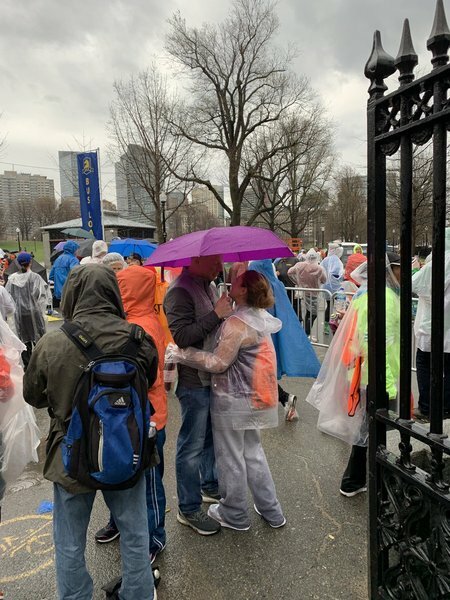 Michael Vaughn, 50, and Laura Hermann, 29, had some advice for Doug Guthrie, 53, before he boarded the bus to Hopkinton for his first Boston Marathon. “Be ready for anything,” said Hermann, from Cincinnati, who has been training with Guthrie for six months. 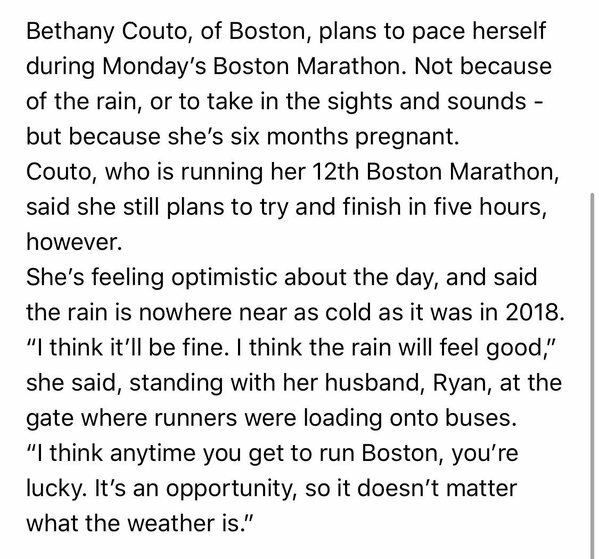 She is running Boston for the fifth time. Vaughn and Peter Buffington, 41, are longtime friends with Guthrie. The trio met in Orlando, where they still live. 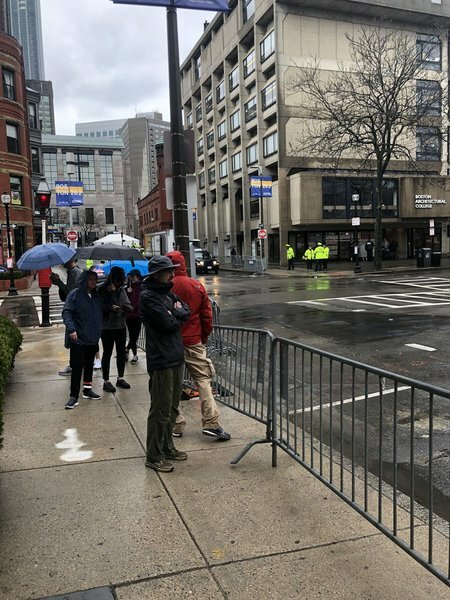 Orinthal Striggles, 43, of Columbia, S.C., is running in his 65th marathon today, but said that in his 11 years running, he has never seen conditions like the ones impacting Boston. 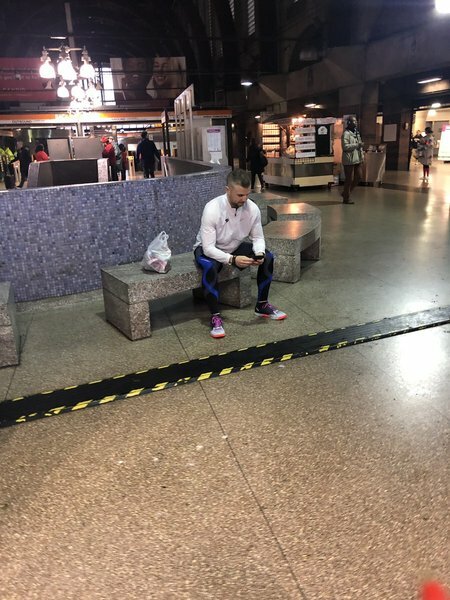 Striggles knelt down on the wet brick sidewalk on Boylston Street, tying plastic Market Basket shopping bags over his neon green sneakers before hurrying to board the bus to Hopkinton’s start line. 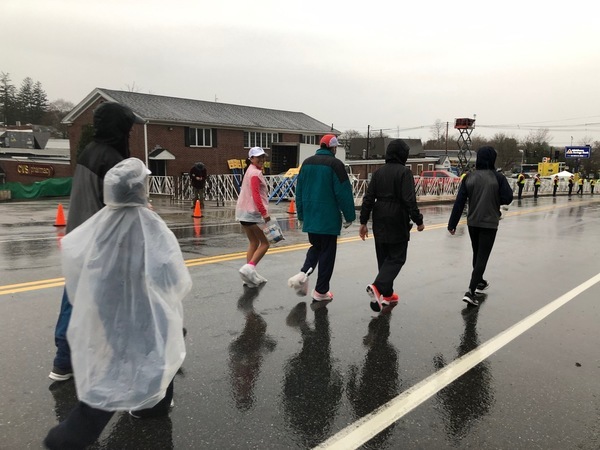 While he thought the weather was adding to some pre-race confusion as runners hurried in all directions to board buses, check gear, or shelter from the rain and wind, Striggles said the forecast would not affect his performance. 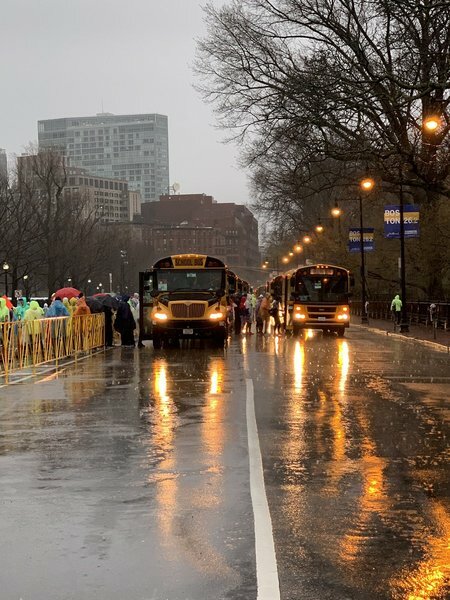 Bus loading for participants has resumed as originally scheduled. 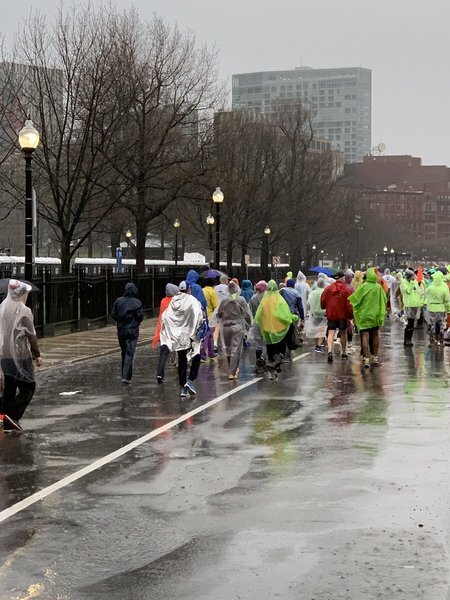 Thank you to all participants for cooperating through the inclement weather! 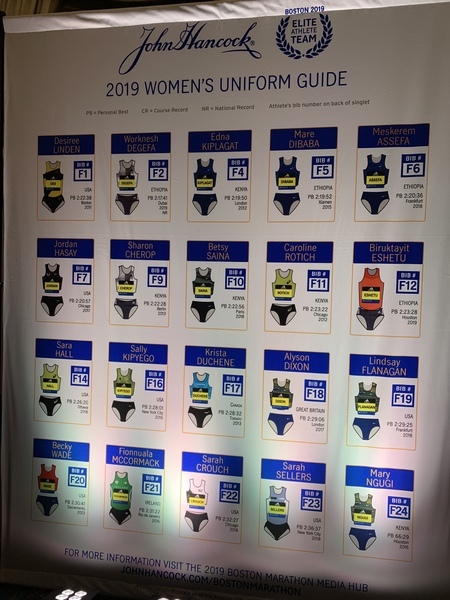 Uniform guide for the Women's Elite field. 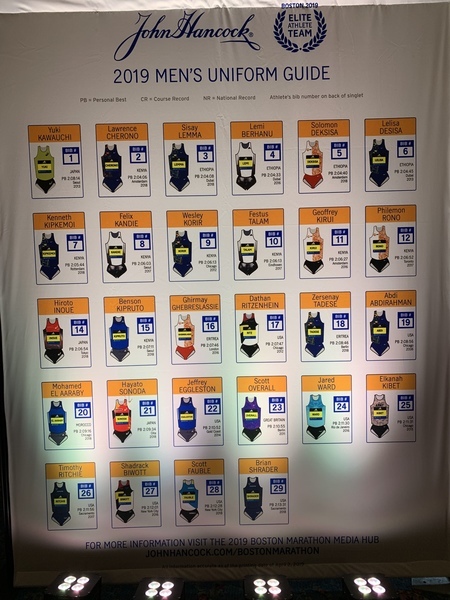 Uniform guide for the Men's Elite field. 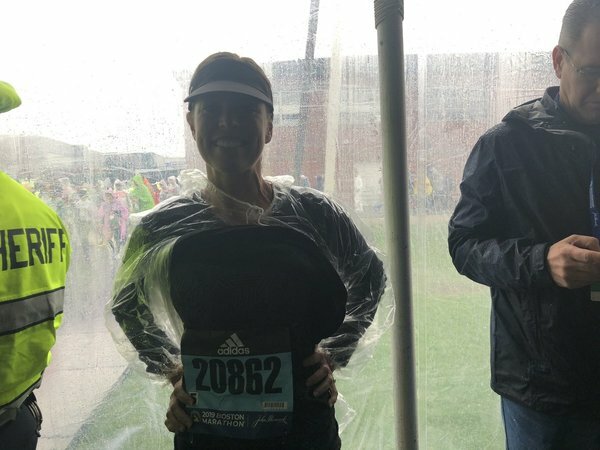 “You chafe in places you didn’t know were at risk,” one marathon runner to me when asked about running in the train.